Etchilhampton, Nr Devizes, Wiltshire. Reported 8th August. 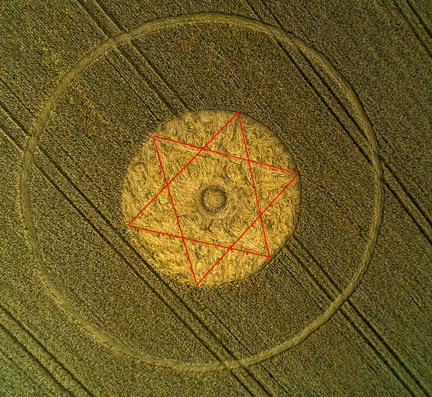 If we look closely, we can see the hexagram in the middle circle of this crop formation. Thanks to the photographer. 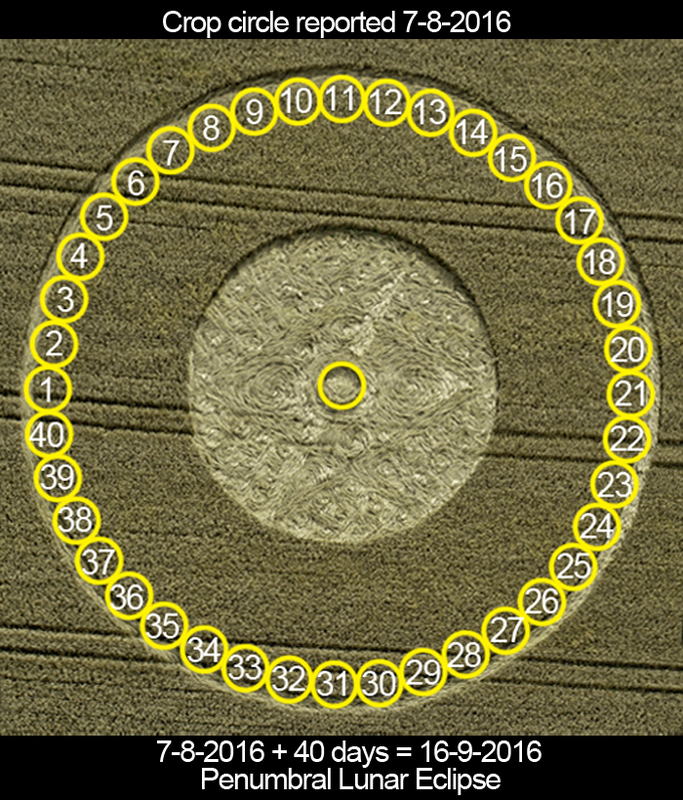 After the beautiful flower crop circle at Westbury White Horse, we see a seed placed on the earth–promise of a goodly harvest. The six-pointed star refers to the six-petalled flower we have witnessed at Westbury. The life-supporting masculine and feminine energies plant themselves as a harmonious unit on our Earth to renew and continue a Creation of purpose, hope and future growth. Upon second look, I noticed that the hexagram in the middle circle is not the traditionally known one that is made of two separate triangles. 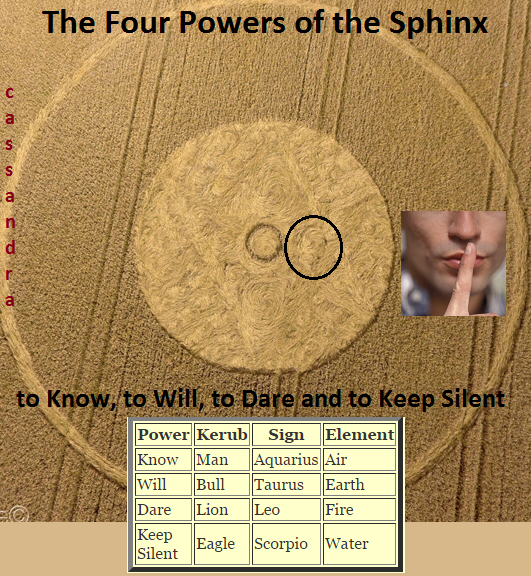 It is more like what is know as the Magic Hexagram. 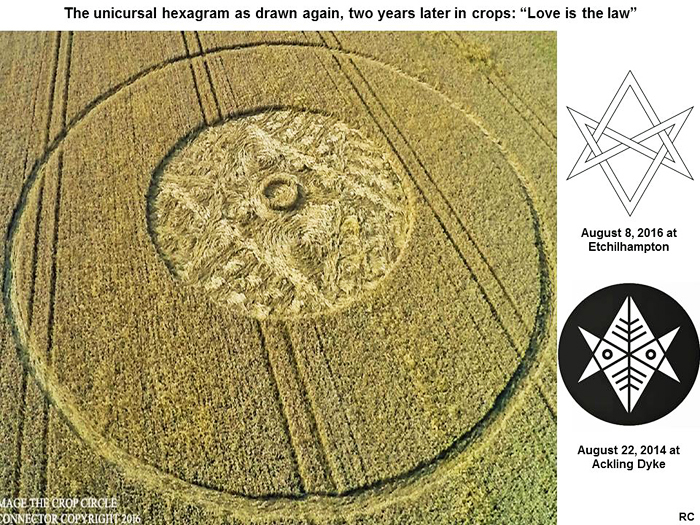 Even with this altered perception of the hexagram in the Echilhampton formation, the meaning as stated in the first look still stands and in a stronger way even, since the ‘Oneness’ of the two different energies cannot be broken. 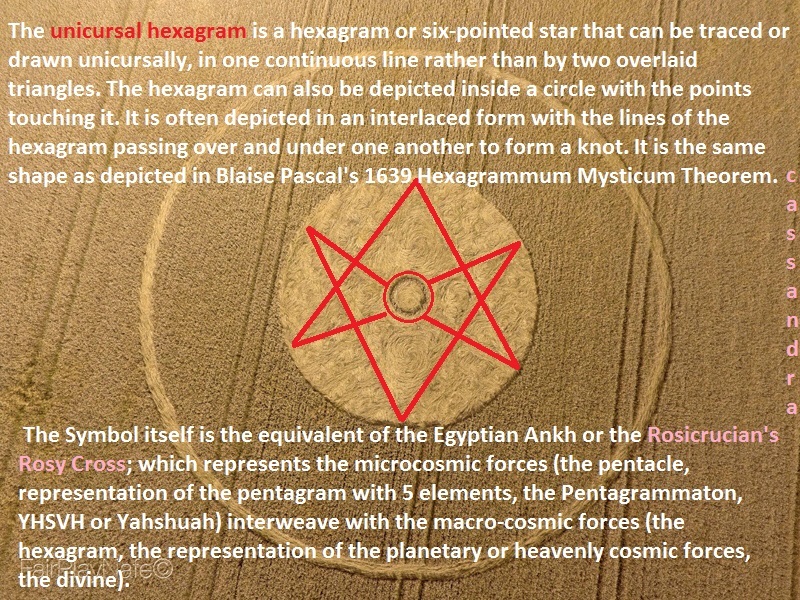 This ‘magic hexagram’ seems to be more like what has been included in the ‘seed’ design. Walker, Barbara. The Woman’s Dictionary of Symbols and Sacred Objects. Castle Books. Edison,NJ. 1998. 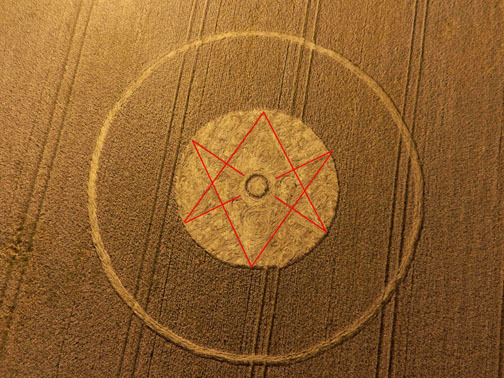 Have noticed that the “star” pattern detailed in the comments section in the August 8th Wiltshire circle is incorrectly identified as the Star of David. 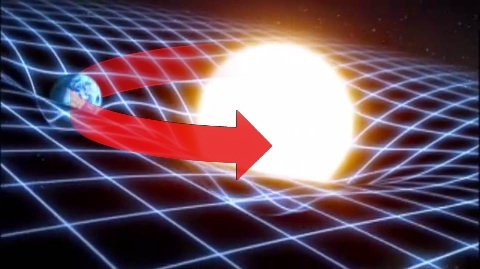 I have attached a diagram of the “star” as it actually appears. The background of the pattern is a careful basket-weave-type crosshatch, amid which are “swirls” of differing sizes as I have indicated in yellow. There may be more than I’m seeing on this image, but it would appear they denote stars/constellations. Perhaps someone with better images can see more accurately. I haven’t highlighted the “swirls” within the triangles as they seem fairly obvious. Many thanks for all your valuable work! It’s a wonderful resource and service you are maintaining. Fabric of space traversed via wormhole? 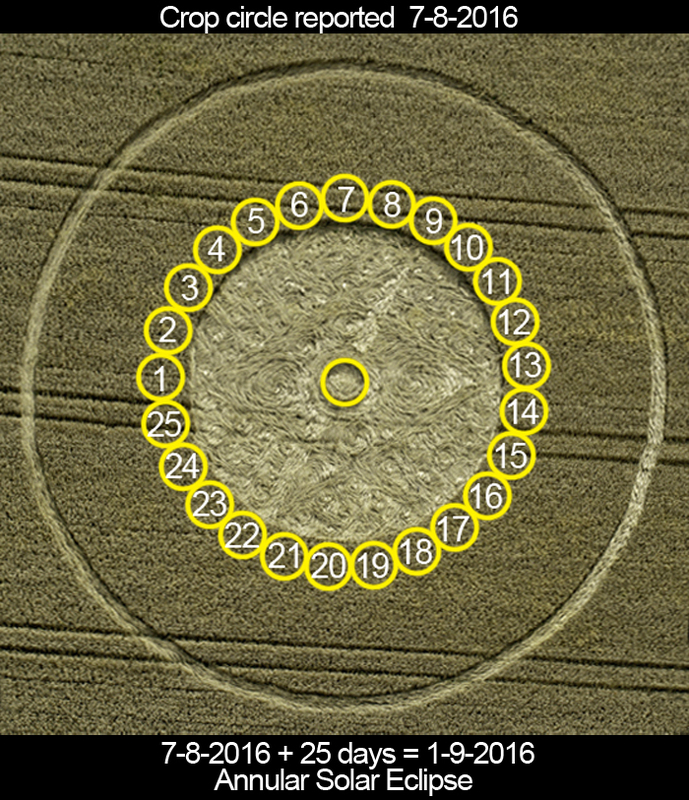 I have highlighted the “grid” of the background of the circle. Green indicates “over” and yellow indicates “under” as best I can discern - so the background does not appear to be a weave as such. Also, the grid does not present as a single uniform background grid upon which the hexagram etc are laid. There appears to be two grids, left and right, as separated by the centre line of the hexagram (point to point). I believe the blue triangle sits atop the red triangle and so the hexagram isn’t intertwined/knotted as this pattern is often depicted, i.e. they are separate entities - not one in the same. Re my previous assertion that the swirls amid the weave seem to denote constellations or the like, it is certainly difficult to say definitively that the swirls aren’t simply the method the maker used to create the spaces in the grid. In some instances the swirls seem to rise prominently above the grid, and in others they are somewhat obscured. Indeed, in some sections there are two swirls per grid square. In either case, they certainly further represent the fabric of space. 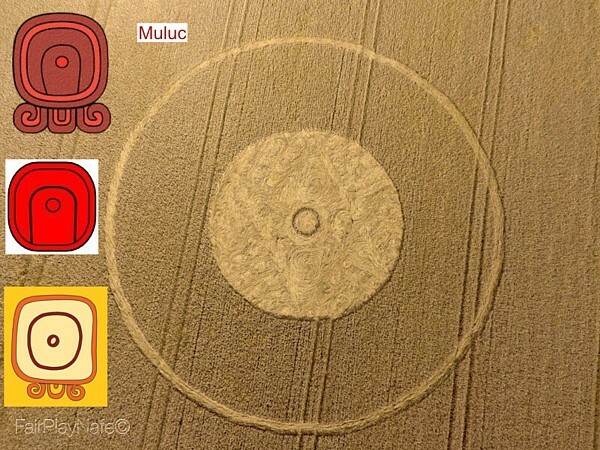 Today is “1 Muluc” and connects with the annular eclipse on September 1. - There are exactly 6 × 6 × 149 lunar months in between (= 22 Katuns). - While September 1, 2016 is 1 Muluc, December 25, 1582 is 6 Muluc (both dates: classical count). The formation also has a subtle reference to the future. While 24 days ahead in the future refers to the annular eclipse, 24 trecenas (a trecena = 13 days) ahead in the future refers to June 16, 2017. On June 14 to 16, 2017 cosmology shows a hexagram (see: Double triangle refers to June 15, 2017). This is also a day 1 Imix (Cosmic Tzolkin), which is the first day of the Tzolkin-calendar). A comet has been moved out of orbit and positioned to strike Earth (the outer ring). Also, the small inner ring indicates that the specific impact area for Earth has been determined. This comet may be one of the later ones coming in from the Kuiper Belt or the Inner Oort Cloud, since so many positioning crop circles have been made in past years. 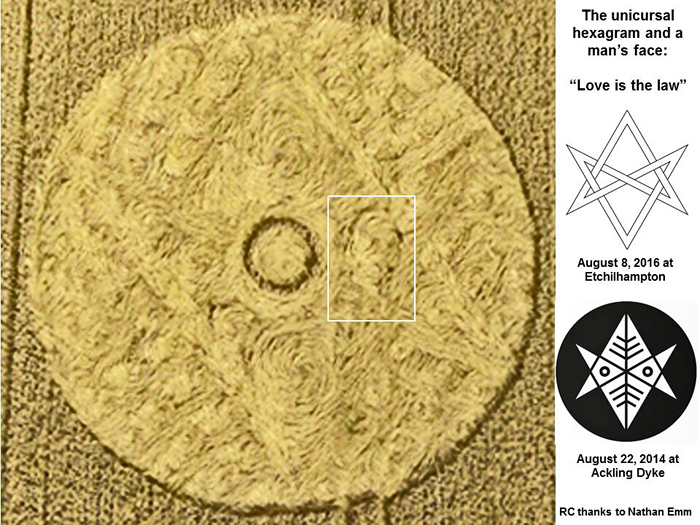 A unicursal hexagram is barely visible just outside the inner circle. This symbol will decline in significance after the comet strikes. 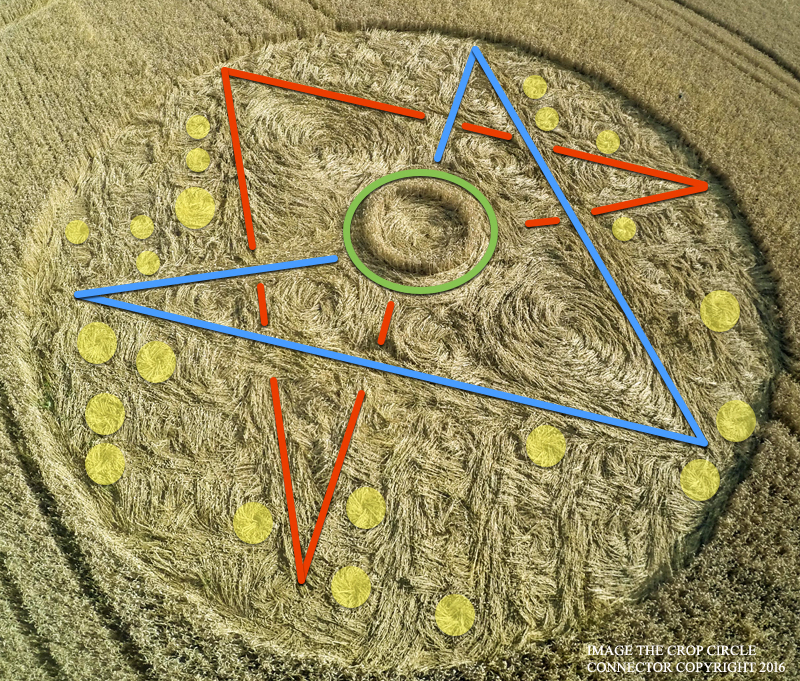 The lay of the crop circle is quite intricate, suggesting the uneven surface of the comet, or to discourage the presumption that the circle is manmade due to its relative simplicity. 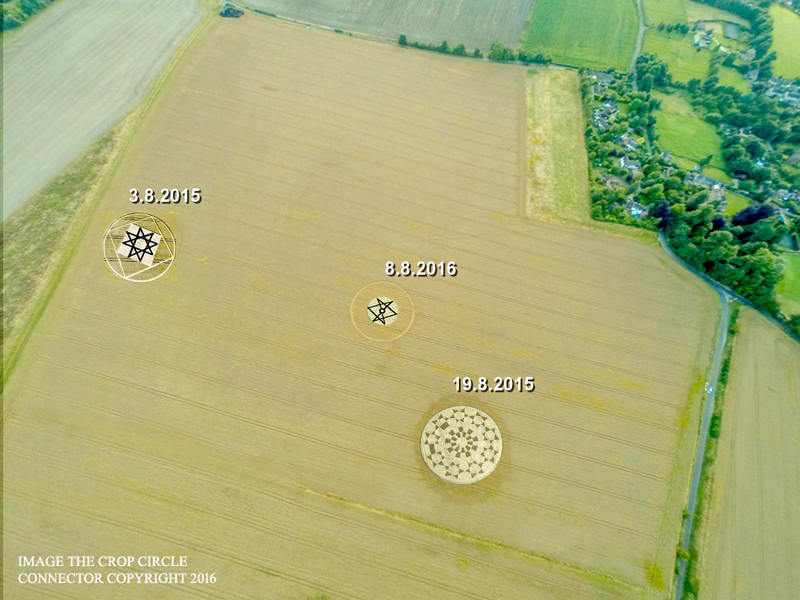 The imagery field were traces of crop circles from 2015. These images I added to the slide. 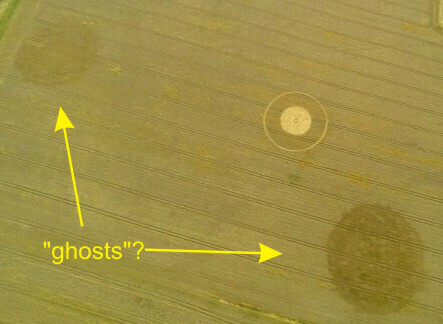 I would like to share this mirrored image with you of the above crop formation. This formation is now made up of two right sides. When you zoom into the image you will clearly see in the top shaded area of the formation a mystic being that is wearing a tall turban. His hands are stretched out in front of him and he seems to be holding something in each hand. Take note here of his eyes as when you zoom into them you will see that they are looking right at us. In the middle of the centre circle there is now the face of an alien being. Could this alien being be coming through a wormhole? And I very much like the elaborate pattern that now frames his face (or this wormhole). This alien being is not looking at us like the mystic man above is but instead he seems to be looking down where the two figures are that are in front of him. For there are another two beings, which can be clearly, seen by turning this formation upside down. The top male figure that this alien being in the centre is looking down at looks very important indeed. I feel a great sense of authority from him. Also take note here that at each side of this important being’s head is the head of a young boy this boy is looking one to the left and one to the right. Standing in front of this important looking being is another being with outstretched arms. He seems to be wearing a crown and he seems to have something just under his lips as his mouth is closed so whatever this is its not coming out of his mouth. It could be some kind of goatee beard. I feel that both this formation and the “Hundred Day Calendar” formation have totally different vibes coming from them compared to the other formations that have been laid this year. These two formations almost seem alive. They almost draw you in when looking at them. It’s as if your brain is adjusting to another unseen world. I’m just wondering if we aren’t going to see some very different formations next year as I believe these two formations are just a taster of what is to come. Calendar with dates of eclipses, tilt of the Earth axis and dimensional spacecraft. According to the Mayan calendar, 8th August 2016 is a day of the Blue Spectral Storm Year, which began on 26th July 2016. Activation, Catalyzation of the processes, Energy, Self-Generation. 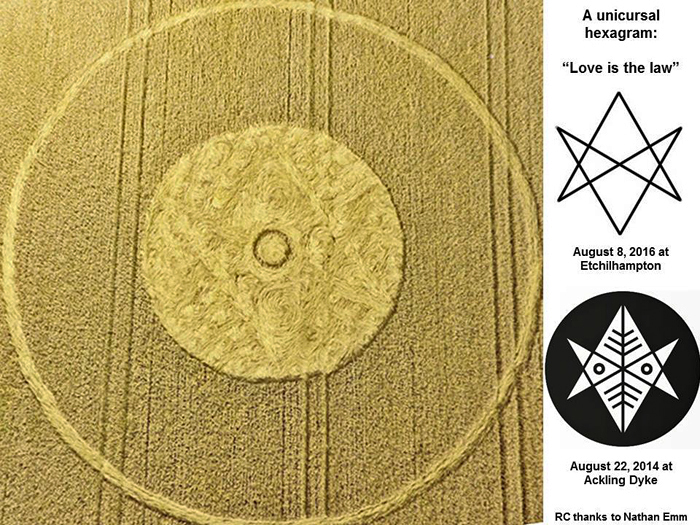 On the crop circle we see myriads of swirls, which depict whirls, vortices. They symbolize the energy "BLUE STORM". And the circle in the center of the formation depicts the “Eye of the Storm” ;-). When we watch the formation under a specific angle, we see the typical depiction of the light body Merkaba. 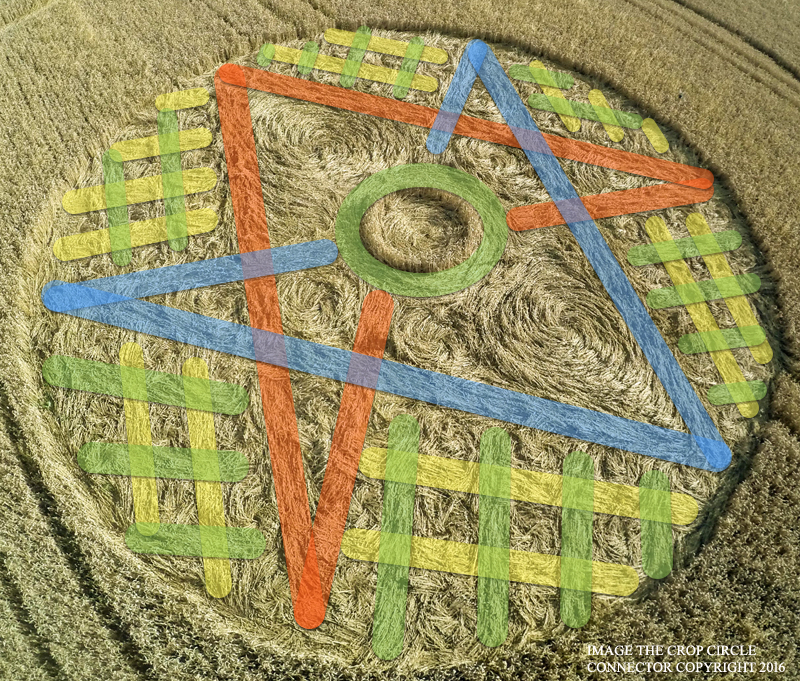 On this way the authors of the crop circle remind us that in the Blue Storm Year we receive the Blue energy of Transformation, which helps for transformation of the cells and cell structures in crystalline ones, which can retain more light. This leads also to the forming of the light body Merkaba. We can use the Blue energy for our personal transformation. For a better assimilation of this energy we can use all kind of energy tools like goals, dreams, intentions, thought-forms, affirmations, meditations, visualizations etc. We receive the Red energy of Beginning. Cells, cell structures, energy bodies are prepared. We receive the White energy of Purification. Cells, cell structures, energy bodies are purified. We receive the Blue energy of Transformation. Cells, cell structures, energy bodies are transformed in crystalline ones. We receive the Yellow energy of Ripening. Cells, cell structures, energy bodies are filled with light. In a Red Moon Year we receive the Red energy of Beginning. In a White Wizard Year we receive the White energy of Purification. In a Blue Storm Year we receive the Blue energy of Transformation. In a Yellow Seed Year we receive the Yellow energy of Ripening. Deep gratitude to the authors of this astonishing crop circle and to the photographers from www.cropcircleconnector.com !! Some CC are, in my opinion, a "picture" of an event. This event represents a big explosion/impact over the surface of the planet seeing from above. 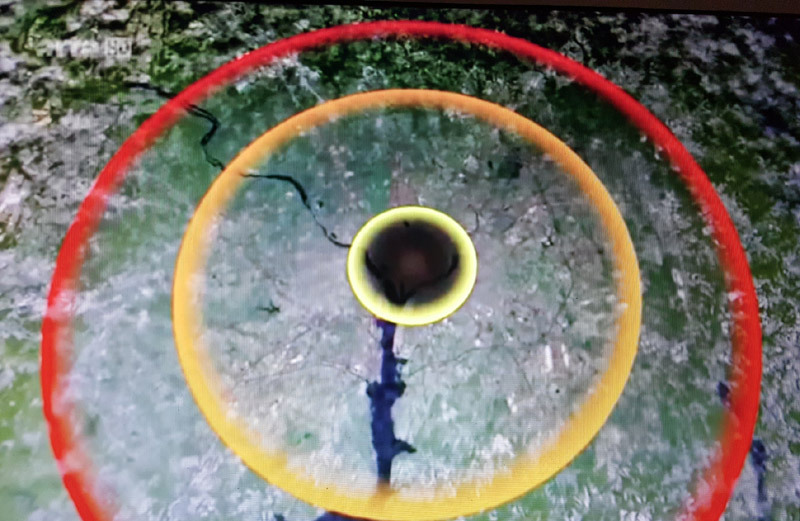 The inner ring is the impact area surrounded for the devastated area caused for the blast wave depicted by the second ring.